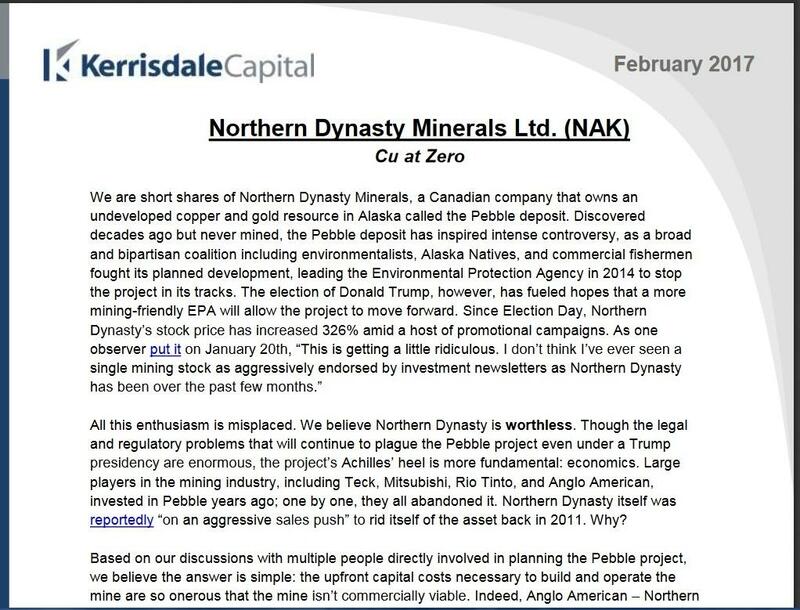 Kerrisdale Capital report takes aim at Northern Dynasty, whose stock skyrocketed after Trump election. Investor says stock is "worthless," noting physical, political challenges of developing Pebble Mine. A 20 page report prepared by Kerrisdale Capital, a New York based hedge fund specializing in activist shorts, slammed Northern Dynasty stock as "worthless," driving the price down quickly Tuesday. “Worthless” is how a New York hedge fund labeled the value of Northern Dynasty stock in a report issued Tuesday. Northern Dynasty is the Vancouver-based company behind the proposed Pebble Mine, which Kerrisdale said is a project that will never be commercially or politically viable. The report sent the company’s shares tumbling Tuesday, which is exactly what the hedge fund investors were hoping for. Audio Transcript: The report was authored by Kerrisdale Capital, which is run by investor Sahm Adrangi. Kerrisdale Capital is a name few (if any) stakeholders surrounding the controversial Pebble project had heard of till Tuesday. The company used Twitter and a large Washington, D.C. based political strategy firm to tease out the findings of its report, and Northern Dynasty shares plummeted when markets opened Tuesday morning. This is what Kerrisdale does, says Adrangi: look for companies they think are overrated or overrating themselves, research them, and publish the results to try and drive the share price down. It’s called activist short selling, where the investor makes a profit by borrowing shares, selling them high, and buying back at a lower price, according to Bloomberg News. Adrangi says Pebble and Northern Dynasty came to his attention after the 2016 general election, when Northern’s shares shot up over 300 percent in value. But Adrangi believes there is much more that will block the mine’s development than an about-face from EPA, if that even occurs. In the 20 page report he spelled out why he thinks the low grade ore will not ever be profitable to extract, and the large political hurdles the developers will encounter every step of the way. He notes the prior companies who have walked away, including Anglo American, which put more than $500 million towards Pebble before leaving the Partnership. Why he chose to go after Pebble was unclear to many Tuesday morning. While he tossed in a quick, "Yeah, save the salmon" towards the end of the interview, Adrangi says he is not allied with the conservationists, fishermen or tribes opposed to Pebble, and didn’t know about the project until the stock price recently took off. He said his aim was only to challenge the value of Northern Dynasty in a very public way and hope the market would follow his lead. "I think in this instance we were successful in drawing a lot of attention to our report and getting people focused on our arguments. In other situations we’re a lot less successful and the market just doesn’t really care, and is focused on other news items, and we just … we move on to the next company that we feel ought to be challenged." Investor newswires were abuzz Tuesday, as were Pebble's opponents who cheered a fresh trashing of the proposed mine. It is believed Trump's EPA may look more favorably on allowing the project to move into NEPA permitting, which would be a major setback for the opposition who championed a preemptive veto created under Obama's EPA. Pebble was caught off guard by the report and the sudden challenge in the investment arena, where they have enjoyed a solid three months. Northern Dynasty called it a "short and distort campaign" based on unfounded research. Northern Dynasty shares dropped from $3.02 down to $1.92 after the report was published Tuesday morning. They climbed back up to around $2.50 by the end of the day, where they continued to trade Wednesday.